A common question that homeowners ask is: Which lawnmower is right for my mowing needs, a riding mower or a push powered one? While different people will have different needs when it comes to their lawn tools equipment, the best riding mower can provide a lot of benefits to just about any homeowner, especially those with medium-sized or larger yards. The best riding mower will make short work out of yards larger than an acre, is good for extremely damp or thick grass and is also good for areas that have a lot of brush. So if any of these circumstances apply to you, then you might want to look at the following list of the best riding lawnmowers that are currently available. While this lawnmower has a number of features which make it useful for large yards, it also has a couple of things which prevent it from getting higher on this list. It has a tough 60-inch 11-gauge welded steel cutting deck that gives the cutting width necessary to get the job done. This device also has a 27-HP Briggs & Stratton V-Twin motor that’s equipped with electric start and has an electric PTO Clutch. Other features built-into this lawn cutting tool include a manual spring-assisted deck lift, an eight-gallon gas capacity, a cutting height that can be adjusted from 1.5-inches to 5-inches and three mulching blades. Unfortunately, it also doesn’t meet the standards to be sold in California. While this mower isn’t the biggest one available, it has more than enough power to get most jobs done with ease. It has a 24-inch steel cutting deck that has a one blade design that can efficiently cut through blades of grass. This model also has a manual 6-speed transmission, and a 190cc OHV Briggs & Stratton motor. It’s a very light mower that isn’t suitable for any type of terrain other than completely flat ground but it is one that’s capable of handling basic lawn cutting quite nicely. This unit also doesn’t have the ability to mulch grass like other mowers do. A part of Poulan’s Professional line of products, this Polan Pro mower is equipped with a number of features which make it useful for all different types of yard sizes and terrain types. It has a powerful 20-HP V-Twin Briggs & Stratton engine, a 46-inch reinforced steel cutting deck, 20-inch back wheels and 15-inch front wheels, and a 2.5-gallon fuel tank. 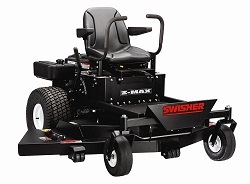 This mower also has a 13-inch mid-back seat, a 16-inch turn radius, an auto transmission and a cast iron front axle. All of the features combined to ensure that the rider has the best lawn cutting experience possible. This zero turn mower gives riders the ability to get their lawn cut quickly and precisely. It has a powerful 22-HP Briggs & Stratton V-Twin professional engine, a 46-inch stamped steel reinforced deck, an electric clutch, a hydro gear EZT transmission and a 15-inch high back seat that’s designed for the user’s comfort. This mower has 6-cutting heights from 1.5-inches to 4-inches, has a welded frame and durable caster wheels. This mower is ideal for cutting medium to large sized yards and is easy enough to use by just about anyone. This lawnmower is not only designed to be a powerful tool in the never-ending battle of grass cutting but is also designed to be quite agile as well. It has a 42-inch reinforced and vented deck that not only cuts the grass efficiently but allows air to keep moving underneath the deck as it cuts. This model also has a 155-HP Briggs & Stratton single-cylinder OHV engine, 6-different cutting positions, an oscillating front axle with a 6-inch turn radius and an automatic hydrostatic transmission. All of which makes this unit an ideal mower for medium to large sized yards. Designed and manufactured to provide power, durability, and traction, this front-engine mower is sure to a be a useful tool in just about any amateur or professional lawn care enthusiast. It has a 22-HP Briggs & Stratton engine that’s fitted with an auto-choke starting system that allows it to start easily with no priming required and a fast CVT automatic transmission that can attain higher ground speeds so the rider can get the lawn cutting done quickly. Its best feature, however, has to be its 48-inch cutting deck that gets any lawn care job done quicker. While this mower isn’t big and impressive as some of the other mower models currently available, it does have the design features to do a great job on medium sized yards that have fairly level terrain. Designed with a powerful 382cc OHV engine with a top forward speed of 4.25 miles per hour and a 6-speed transmission, this model moves around yards quite effectively. This unit also has a 30-inch cutting deck and has five adjustable cutting height adjustment settings. Other features which can be found on this mower include 16-inch rear wheels, 13-inch front wheels and an 18-inch turning radius. This lawnmower features a 20-HP Briggs & Stratton OHV engine that is equipped with a pressurized lubrication system that ensures that oil is delivered to critical parts of the engines all the time without delays. This results in a better and longer lasting engine that’s sure to provide many years of service to the homeowner. It also features a 46-inch cutting deck and has a 6-inch turning radius. The last feature to speak of is its automatic fast transmission which allows the mower to travel approximately 5 to 7 miles per hour. Powered by a reliable 19-HP 540cc Briggs & Stratton motor, equipped with a mid-back seat and featuring a soft-touch steering wheel, this lawnmower is the best combination of power and features. It has a 46-inch side discharge mowing deck that is capable of mowing in reverse, a manual power takes off, and a single cylinder auto transmission. All in a unit with a step-thru frame and a deck wash system that makes this model easy to use. It also allows the user to set cutting height to five different cutting positions, so the lawn can always be cut according to the user’s preferences. This mower has many of the features that homeowners look for when they look for a ride-on mower. It has a 42-inch cutting deck, which is big enough for all but the largest yards and has a powerful 18-HP engine that makes short work of any mowing job. It can be quickly assembled by the user in about 3-hours and once up and running drives nice and steady. All things considered, it’s a model that can make short work of a variety of jobs and should be a useful tool for just about any homeowner. It even has the power and maneuverability to handle uneven yards.